Search Engine Optimization (or SEO) is necessary to market your business online. The better your SEO, the higher your website will appear in search engine ranks like Google or Bing. It’s not rocket science–more eyeballs on your website means more potential customers will call, leading to faster business growth. It’s every business owner’s dream, and it all starts with SEO. There is no shortage of hacks, cheat sheets, and gurus with the latest secrets “that Google doesn’t want you to know about”. The truth is high search engine rank is a competitive game. Trying shady techniques to trick the system can actually hurt your SEO more than help it. But never fear! You can improve SEO with these 5 easy, free and Google friendly techniques (sorry shady gurus). By creating and maintaining an active blog you’ll not only be showcasing your expertise, but you’ll also be giving your website some serious SEO juice. What can a blog do for your website? For best results understand the types of people you want to attract and what they want to see. And don’t forget to encourage visitors to share posts with their friends! The presence of social media has made link sharing extremely important to search engine rankings. Many small business owners have a love/hate relationship with social media. They love that it’s a free way to market their business, but hate the time, frustration and drama it takes to build a community. Increased social sharing = increased credibility. It’s hard to fake social sharing. Google is vain and loves Google+. In the new world of marketing, content is king. If you’re only sharing images, videos and blog posts from someone else’s website you won’t be gaining any SEO juice for yourself. So be sure to keep your ultimate online marketing goal in mind and send followers to your website whenever possible. If you’re a local business don’t be afraid to network locally. Networking doesn’t translate to awkwardly swapping small talk with a sweaty stranger. Think of local events as a way to entertain and educate your social media and website followers. You can live tweet the event, share pictures or videos on your website, tag other attendees or even take something you learned at the event and turn it into a blog post. By getting out into the community you’ll connect with locals, create social media buzz, improve SEO and increase exposure for your business. So at this point we’ve established that an effective blog and social media presence is a match made is SEO heaven. But there is one common hiccup we need to talk about! How do you get your blog in front of NEW people without spending a fortune on Facebook ads? We love loyal fans, but the more traffic, social sharing and backlinks you have the better off your online marketing will be. One easy solution to this problem is sharing your blog posts with the help of social bookmarking. Social bookmarking sites like Reddit, Digg, StumbleUpon and even Pinterest allow business owners to add content links (blog posts, videos, etc.) to their online directories. The links can then be discovered by new people and lead to new traffic, unique page views and even more social sharing. But be warned: not everyone is going to fall in love with your blog. The key to social bookmarking is getting seen by the right people. So take the time to research possible keywords before posting to these types of sites. People are drawn to passion. They want to align themselves with brands that support what they believe in. Figure out which causes you and your followers both support and then get to work! This could mean helping to promote cause efforts through blog posts or even taking up a collection for the cause on your website. Whether it’s social causes, animal welfare or helping to save the planet, share your content and help create buzz for your cause through social media. Even small scale efforts can mean helping a good cause and a healthy dose of traffic back to your site. There’s just one catch. Your support for a cause has to be genuine. People can smell phonies from a mile away, and they will make a point to tell you about it online. Trendy causes come and go, so follow a cause that speaks to your heart. 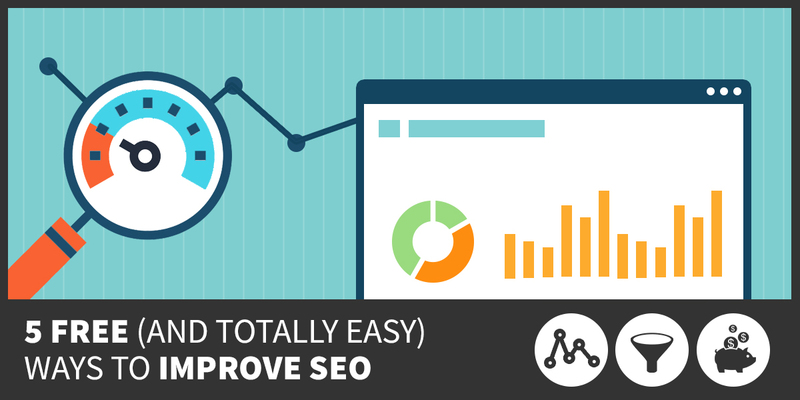 There you have it folks, 5 free and super easy ways to improve SEO. Now we want to hear from you! Which of these techniques are you already using and which need to be added to our list? Let us know in the comments below. Mike, thanks for caring and sharing. I really appreciate and value your opinion and insight. Our blog on AnimalHumanConnection is good, but I don’t have many who leave comments. I will be more diligent asking for what I want from readers after your suggestions.